Terry Edwards reports on one of his favourite waters. Approximately eighteen kilometres north of Strahan, the Henty River emerges from dense mountainous bushland and winds it's way to the rugged west coastline of Tasmania. The river originates from within the West Coast Range, a dozen or so kilometres south of Rosebery. Several small streams and rivers contribute to the flow from this system, providing a seasonal scenario similar to the mighty Pieman River. In fact, I tend to refer to the Henty as a miniature, compact Pieman River. Access to the Henty is limited, via a launching area immediately adjacent to the south western end of the bridge. This is approximately fifteen minutes drive from Strahan. The launching area is a relatively steep gravel incline, with parking restricted to about three or so vehicles with trailers. Such are the confines of this area, that one or two vehicles parked thoughtlessly will severely hinder access and exit for others. Under normal circumstances a two wheel drive vehicle will suffice for launching. My Mitsubishi can (trout mobile) will bear testimony to this. I shall provide forewarning to those who have not visited this water, a small light boat is recommended, both for ramp access and suitability for river conditions. Extreme care is advisable at the boat ramp, as about two metres out in the water, the depth immediately increases to almost ten metres. Tidal influence is not great near the bridge with little effect to boating until about one and a half kilometres downstream of the launching ramp. This river has at times been isolated from the ocean due to rough weather and constant sand movements. Over the years the river mouth has relocated by the forces of nature to extend of a kilometre or so, now running parallel to the shore before discharging into the ocean. Once downstream, care should be exercised by boaters upon emerging from the heavily forested banks as the exposed sand and tussocks become evident. Here the river shallows and widens, with extensive sand flats, channels and interconnected lagoons, not to mention the obligatory submerged logs and rocks dotted here and there. To negotiate this area at speed is not advisable. There is around a kilometre of such with the last five hundred metres narrowing and deepening slightly, and improving with the high tide. I have noted that an incoming tide does not flood the estuary with salt water. The major influence at the mouth would appear to stem the outflow of the river causing a slight rise in level. It is here in the lower reaches that the superb sea run trout can be taken during the whitebait season. This southern sandy river bank is adjacent to informal camping areas, accessed via a track approximately two kilometres past the bridge, off the main road leading to Strahan. I am not familiar with this track, though colleagues advise the use of a four wheel drive vehicle as a few boggy patches may be evident. Yet again, a small light boat can be trailer-ed or car topped if desired. My observations from the crests of the dunes indicate quite a few sheltered, grassy areas ideal for camping. As stated previously, these sites are informal, with no facilities. If an overnight stay is preferred, you must be self sufficient, including a supply of fresh water. Be aware that Strahan is the nearest town providing services, accommodation and supplies. It is recommended to fish from September through to late December providing the whitebait are visually apparent in reasonable quantities. A sustained and solid run seems to generate intense activity from both sea and river trout alike. Do not be afraid to try January and February if you wish to troll, as the big river trout are still rather partial to a lure. They seem to prefer cloudy overcast conditions with best times being early mornings and late afternoon. For those who do not wish to use a fly rod, spinning the extensive sandy river banks will provide adequate results. Shallow running lures such as small minnows, cobras, spinners and wobblers should prove effective with a passion for spin fishing. Others may wish to capture live bait on site at the estuary bearing in mind current regulations relative to the gathering and use of live bait. Apart from the lower estuary/dune areas described, the remainder of the Henty River is only suitable for fishing with the aid of a boat. Shore access is extremely limited due to the steep banks and dense forest. All of the river is accessible by boat and there is an abundance of galaxias as these seem to be predominant in the diet of the resident trout. I have never tried bait fishing in this river, but my two sons have noted that eels are prolific during the evening hours, taking any bait offered. Extending up river from the seaward limit of the bushland, the river deepens from around three metres and slowly increases to almost ten metres close to the bridge. Above the bridge the depth averages to around seven metres for a kilometre or so and fluctuates from approximately three to ten metres according to bottom structure. I would consider the limit of practical boating to be two kilometres above the bridge, having travelled in excess of six kilometres up river from the bridge. From this point the boating could be only described as adventurous, having already navigated the winding river with substantial depth fluctuations down to less than a meter in some areas. Unfortunately it seems that half of the forest has collapsed into the river and snags and obstructions off all descriptions abound. Ideal spots for those big river trout, but be prepared to part with lures, especially if using lead core line. It is frustrating when the best fish tend to inhabit the most snaggy areas. A good quality sounder with enhanced structure definition will assist when trolling, but I am sure some of snags ambush my expensive lures. Equally frustrating is the screen display trout or shark proportions cruising in mid water and seemingly not interested in accepting a lure. I should not complain as this happens everywhere. I must admit to not frequently visiting this river at the peak of whitebait season. At this time of year most of my favourite waters tend to fire at once. 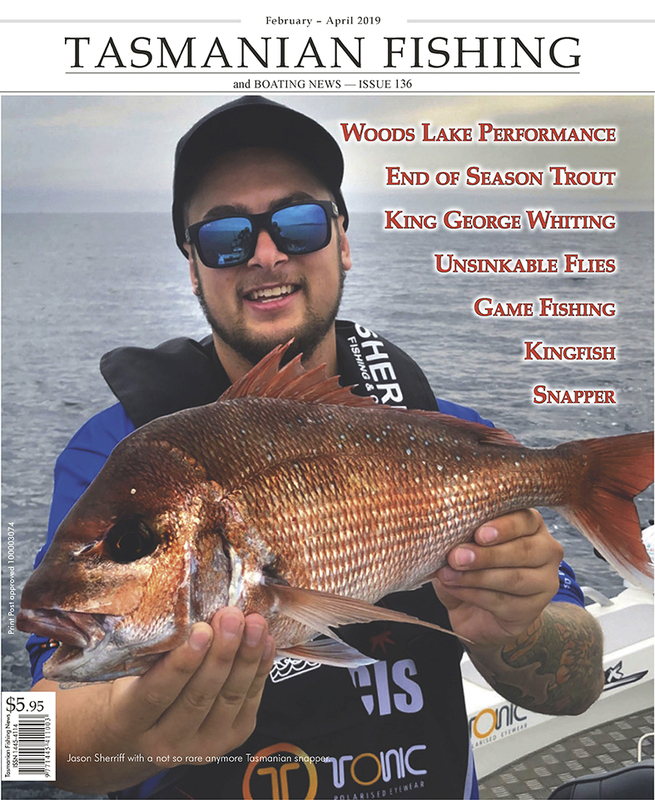 Despite all of these distractions, experience has proven that a trip to the Henty River after whitebait peak can still produce the odd sea trout remaining in the lower reaches. These sleek silvery fish will accept a fly or lure. But what of the resident brown trout population? Most people overlook this aspect after the whitebait run terminates. Please observe the Pieman River, from the start to the peak of the run there, the launching facilities and accommodation are absolutely packed. A month either side of this period, the river is almost deserted, apart from visiting shack owners. Incidentally, there are a substantial number of fishermen who haul in a very hefty fish claiming they have boated a sea runner. In some cases these fish do not possess the characteristics identifying them as such. A fair percentage of the fish are just river residents, the same as those found at the Henty River. They are the one's enticed into accepting a lure if you persist. Don't expect to bag out, or even immediate success on your first visit. As with all waters the conditions, experience and lots of luck must prevail before a reasonable trip can turn into a great trip. I must remind myself of this, as I have been known to return with an empty bag, convinced that I could not catch a fish with a deadline at Salmon Ponds. 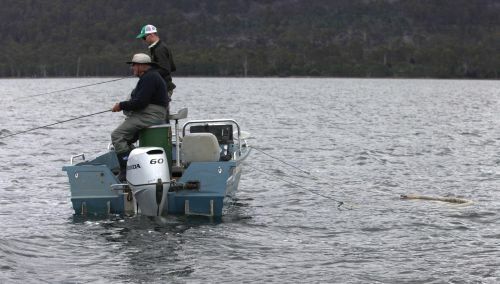 To troll the Henty River can be the same, but luckily I seem to manage a fish or two, with the chance of picking up a heavy weight. One trip produced twelve legal sized fish, one of eight and a half pounds, two of six pounds and the remainder being of various sizes. The next trip produced several, the largest was six pounds. These fish are not easy to come by, but remember that first you are required to hook one and then actually land it. I used only six pound line as this gives a bibbed lure, flatfish or cobra style lures more action whilst achieving maximum depth. Obviously this light gear in such snaggy conditions can result in a high mortality rate for your lures, so I don't suggest the use of your grandfather's priceless handcrafted lure. The use of a lead core line may be preferred, but three colours draped through a submerged tree can be frustrating and costly. I would also suggest paravanes and downriggers could prove equally frustrating. Most of the larger river residents are old and cunning. Even though they do not possess the acrobatic agility and savage, pace of the highland trout, they hit the lure very solidly to the point where you are sure you are snagged. When you attempt to resist what feels like an underwater tractor, great control and twice as much luck is required. Due to the narrow confines of the river, plenty of cover is available for that crafty fish. This makes for an interesting and exciting battle where fish and angler are on equal footing. Such conditions may not suit all that wish to try their luck at the Henty River, but I would hope the aforementioned text may enlighten newcomers to this river. As for myself, I will yet again revisit this remarkable river. Footnote: During the warm summer months, it is recommended to take your shotgun. This may be you defence against the large and ferocious mosquitoes.